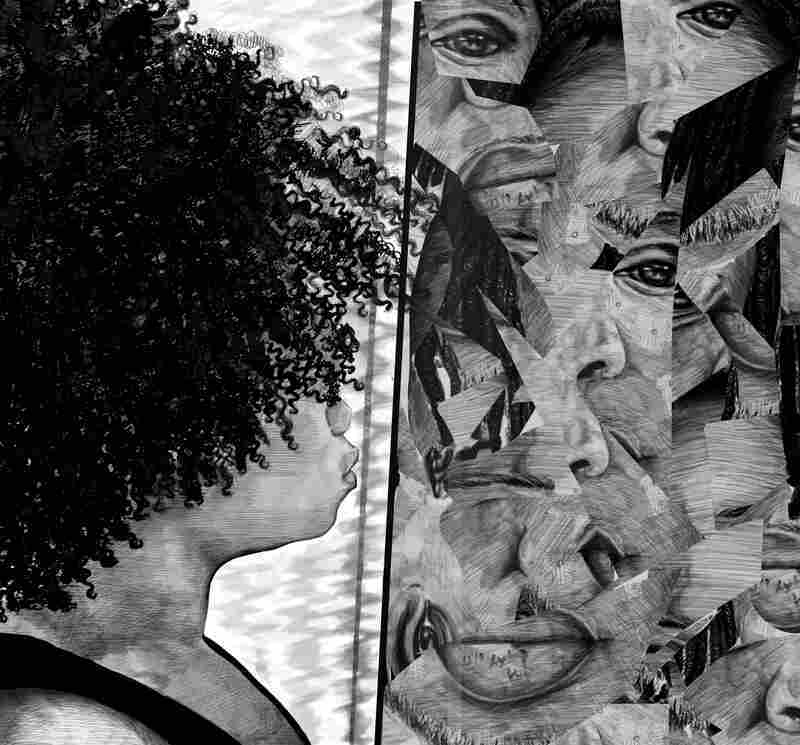 At The Education Department, Student Artworks Explore Tolerance And Racism : NPR Ed In an exhibit at the department's headquarters in Washington, young artists speak out through their work about race, sexuality and about being young and having a voice. 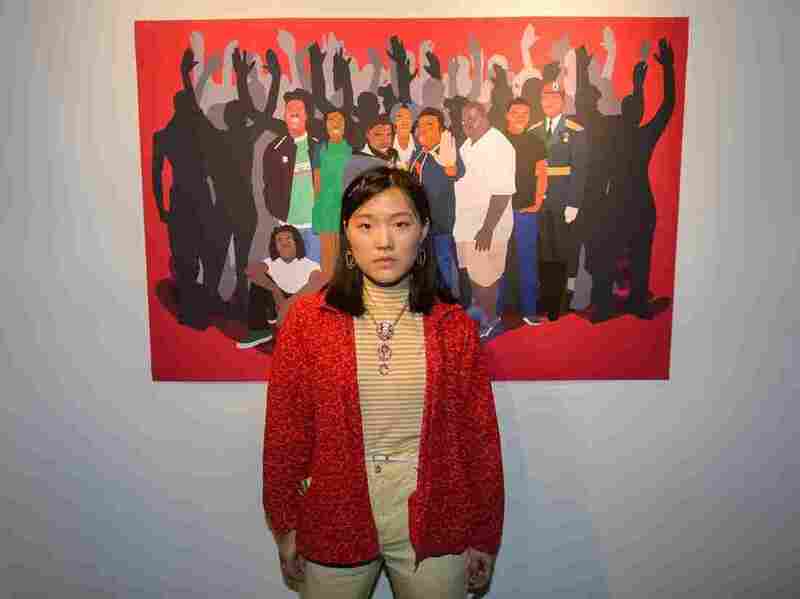 Ameya Okamoto, 18, poses in front of her work. Empathy, tolerance and acceptance: More and more, educators are focusing on the importance of schools' paying attention to stuff other than academics. 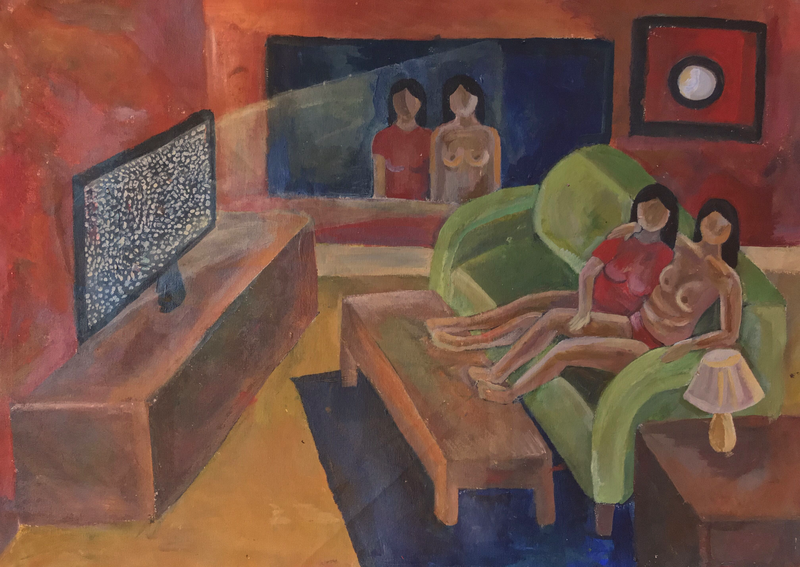 And for the past two months, an exhibit at the U.S. Department of Education's headquarters in Washington, D.C., has gathered the work of student artists expressing themselves — through their work — about these issues. The exhibit is called "Total Tolerance," and it highlights themes of racism, sexism and diversity. 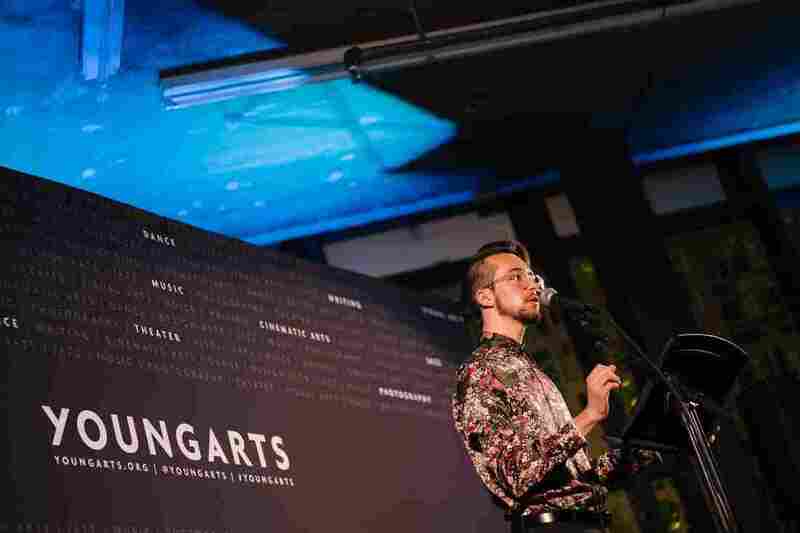 The student art comes from the National YoungArts Foundation, a Miami-based nonprofit that offers mentoring and fellowships to art students from around the country. Its proposal was selected late last year by the Department and the dozens of works of art went on display in May. "This exhibition, it really exemplifies why we do this work," says Carolina Garcia Jayaram, the foundation's president and CEO. "Together, with the Department of Education, we can signal to the country that arts education is a necessary facet of education for all students." 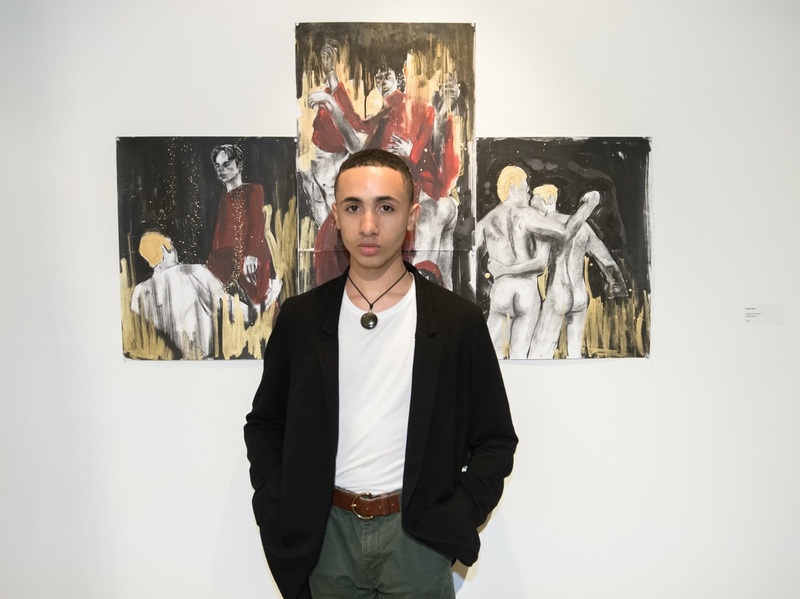 As the exhibit winds down in Washington this week, I spoke with three of the 21 young artists, about their art and about how it felt to have their work shown nationally. Ameya Okamoto, 18, just graduated from high school in Portland, Ore., and will attend Tufts University this fall. Juniel Solis, 16, lives in Miami and will be attending a pre-college at the School of Visual Arts in New York this summer. And Aidan Forster, 17, just graduated from high school in Greenville, S.C., and will be attending Brown University next fall. Our conversations have been edited for length and clarity. Describe your work that's on display. Aidan Forster: My poem, Instructions for Suburban Boy Love, was inspired by the particular brand of queer isolation and loneliness endemic to suburban life in the South. It stems from questions of loneliness and isolation: What happens when you're the only queer kid in your neighborhood? Or in your family? Or in your youth group or your circle of friends? When you start to feel kind of like a threatened or endangered species? I think for me, queerness is very much like an aperture for language — a mode of filtration for experience. Ameya Okamoto: So I have a couple digitally painted portraits in "Total Tolerance" that are a part of my memorial portrait series, which is ever evolving. 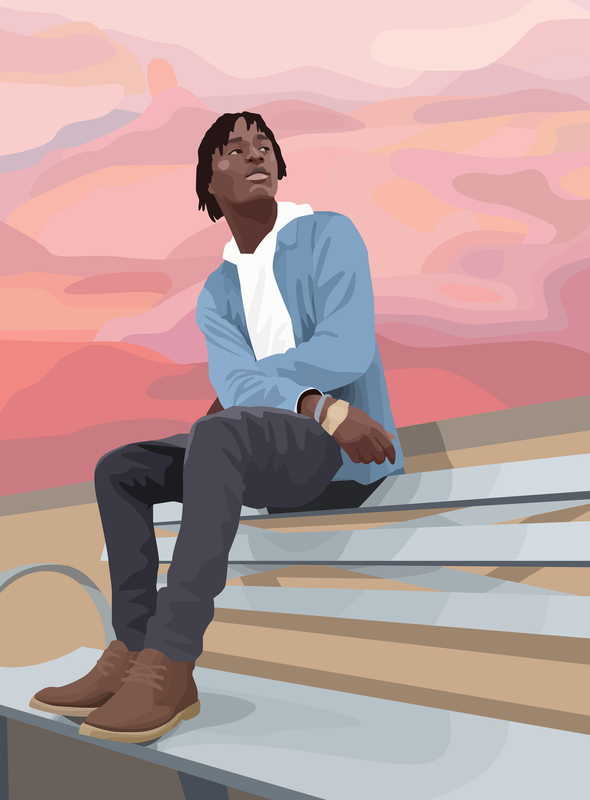 "Black Life: Quanice Hayes," by Ameya Okamoto. The portraits are about celebration of the lives that have been lost to police violence, but also about overturning negative imagery. One piece is of a boy named Quanice who was 17 years old when he was shot and killed in my hometown of Portland. At the time Quanice was 17, and I was also 17, and so having someone who is only a couple train stops away killed, that was extremely jarring to me. I had to do something, so I created a portrait using photos, and that piece became so important because it started being circulated in the media, and it started to replace an old mug shot from a couple years back. I was able to meet with Quanice's family and give them a print, and that was an extremely moving moment where I realized I could give them a gift of celebration, and in some way help to heal. And I could also use my art to create a positive message and create a more positive narrative. Juniel Solis: I have a painting up called Los Pajaritos. 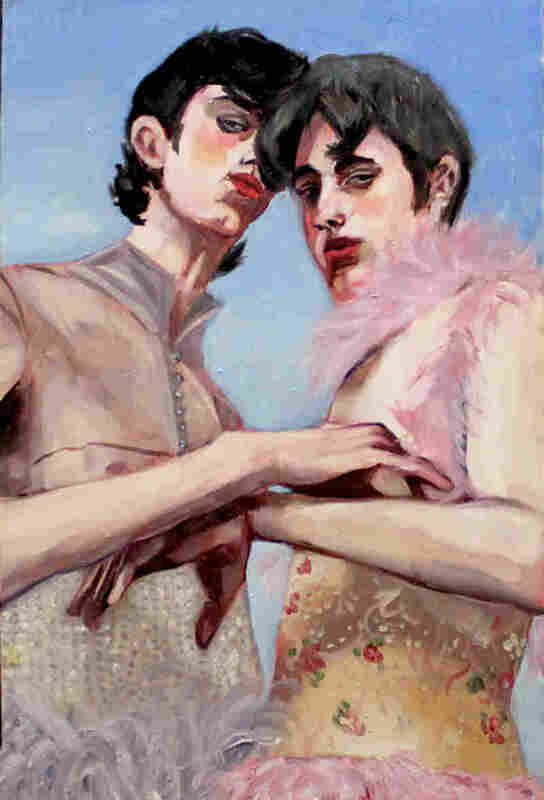 It's a painting of two young adults with makeup and they have a very androgynous feel. They're wearing orange flowers on their dresses. They're men and they're wearing makeup. They are there and you can tell there's a fear in their eyes. What has art done for you? Forster: Well for me, growing up in a very conservative state, in a conservative region, I really struggled with internalized shame around sexuality. I grappled with the idea that my body and desires are wrong or alien or that I wasn't made for love or love wasn't made for me. And as I grew older and searched for a strain of representation, or some sort of narrative that matched mine, I found poetry. I just realized that poetry presented itself as an antidote to that shame I felt, and allowed me to dismantle it and externalize it. Okamoto: When people ask me, "Why do you make art?" I say, for me it's very reactionary in my gut level. This is what I have to do. I make art to help others. I think art in general is how we are going to translate experiences, and share stories, and talk to people across cultures, and across language and across political values or any sort of ideation in general. We can talk to people through color, and stories and visuals, instead of having them sit down and have a really hard conversation. I think a lot of times people discredit minors who talk about real issues and talk about institutional change and talk about social change. So what can I do? I can do grassroots organizing and I can be a part of changing the narrative for people who can vote for people who can make policy change, because at the end of the day it's all in themselves. What sort of responses have you gotten from your work? I'm so humbled to be selected for this. My entire trajectory with YoungArts has just been one humbling sort of blessing after another. There's been sort of a resounding recognition, I think, with the sort of bravado of the piece. Okamoto: My family and friends are usually very supportive, but there are a lot of people who say I'm too young to know anything. With the critics, I kind of ignore it, because if my art touched them in some way, or they felt like they had to respond in some way, then I think at a certain level my art is doing exactly what I want it to do — which is reach out to the people and talk to the people who don't want to listen. High school is good practice to realizing that there are adult haters out there who are going to come after 16-year-olds. 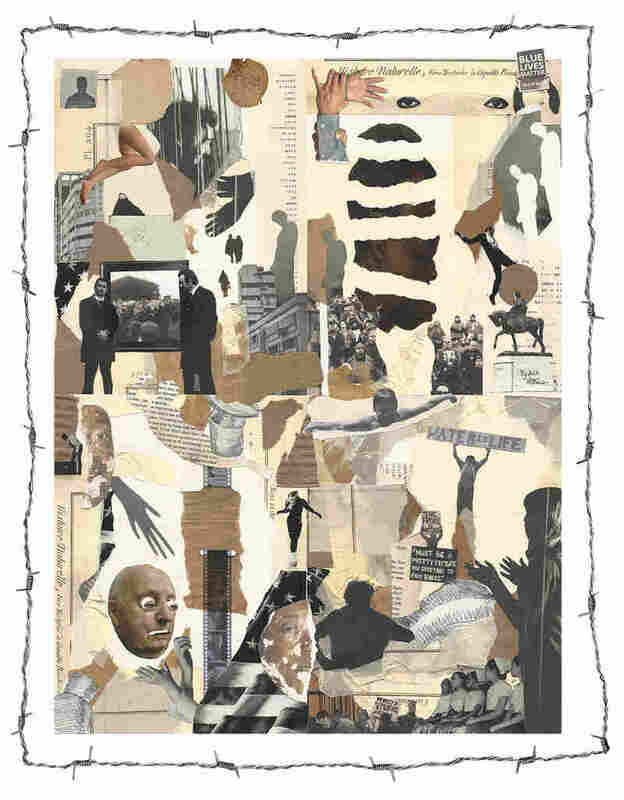 What do you hope comes of your work being on display at the Department of Education? Juniel Solis poses in front of his work. Forster: I think my biggest hope for this is sort of twofold. In the first part is that I envision the show as a sort of promontory for the legitimization and authentication of minority and marginalized narratives written by youth. And so I think this exhibition is proving that some of the most potent and primal narratives at play in artistic planes right now are coming from young people and are coming from these like marginalized voices and voices that have historically been occulted. Okamoto: I think it's amazing to have an exhibit in the U.S. Department of Education that preaches the exact rhetoric that I want to preach, which is equity, inclusion and total tolerance. I hope people see my work and realize they, too, can make work about the things they care about. It doesn't have to be political. And I hope it changes the negative stereotype of the [Black Lives Matter] movement. What do you think the state of arts education is like today in the U.S.? Okamoto: They're cutting our classes. They're cutting our art in general across mediums in places for — you know, quote unquote academic classes. And for me, I think that everyone has the capacity to create. It's just about creating space for people to think about their story and how they want to use their stories to express themselves. What are your plans for the summer? Next year? 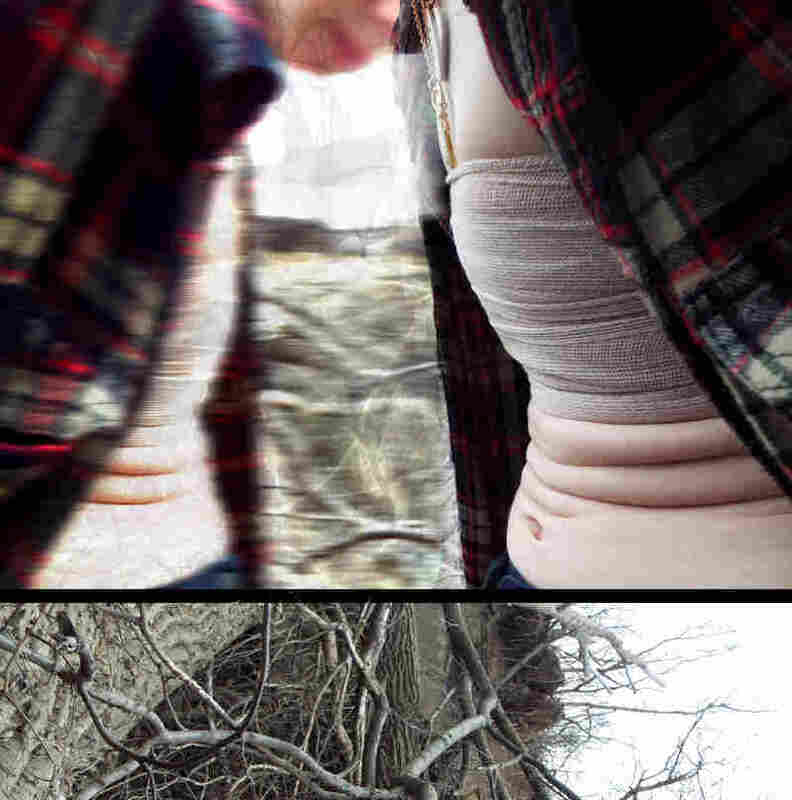 Click through to see some of the other works in the exhibit. 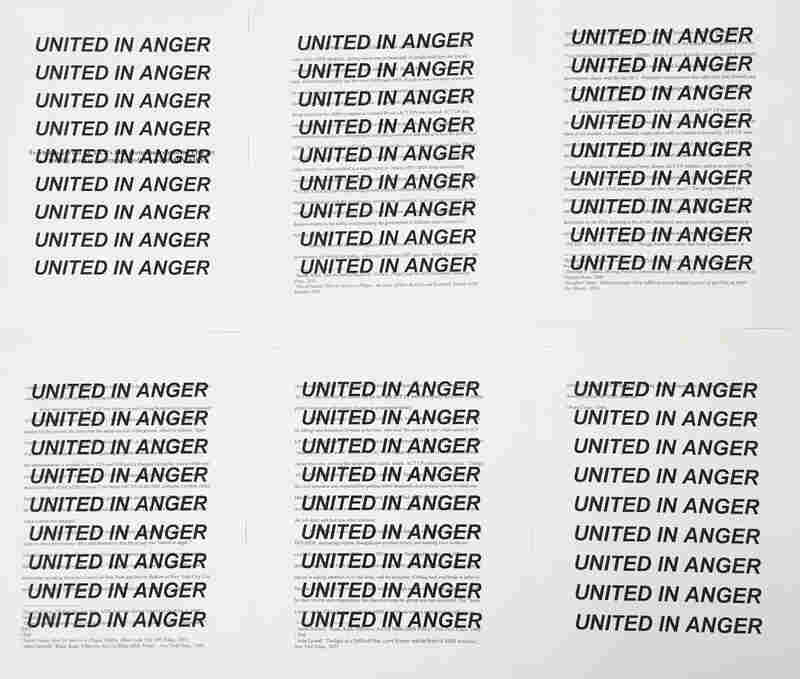 Amal Haddad, United In Anger. 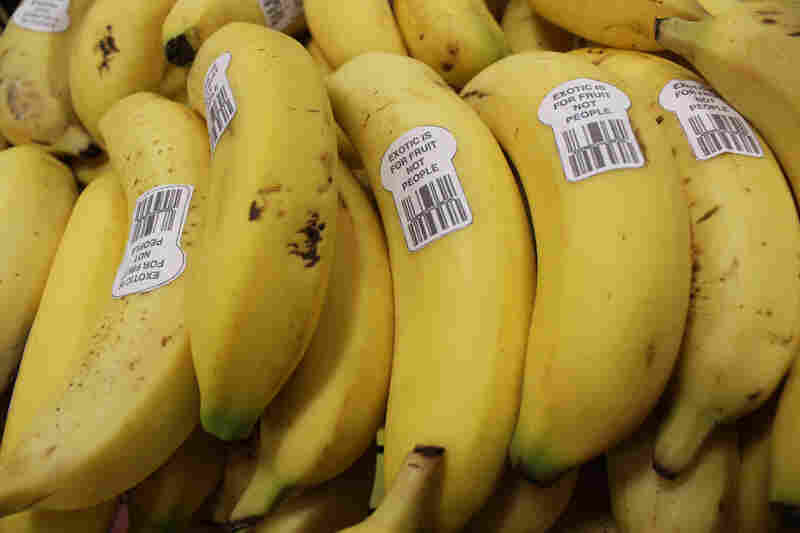 Quinlan Lewis-Mussa, Exotic Is For Fruit Not People. Forster: This summer I'm working to make money for college. I'm hosting at a wild game restaurant, [which serves], like, kangaroo! And I'm a poetry mentor for a summer mentorship program. Okamoto: I will be attending Tufts University — a combined degree program to pursue a BA and B.F.A., so [I'll] be doing interdisciplinary art, race and justice, and neuropsychology. Hopefully, that's my path right now. Solis: I'm not sure! I'm in the process of figuring that out. I'm attending a pre-college at the School of Visual Arts in New York this summer. I'm just hoping for a change in environment so I can come to terms with my work and find confidence in it. Click here to view all the work in the exhibit.